For local or regional businesses, hosting community-based events or activities can be beneficial for reaching new audiences. Additionally, the online promotion of these events can be a vehicle to raise awareness and increase site visits. As an added benefit, we’ve also seen the consistent promotion of hyper-local events contribute to increases in local rankings for key terms. Local events offer a unique opportunity to showcase your organization’s strengths or highlight what makes your business different from the competition. 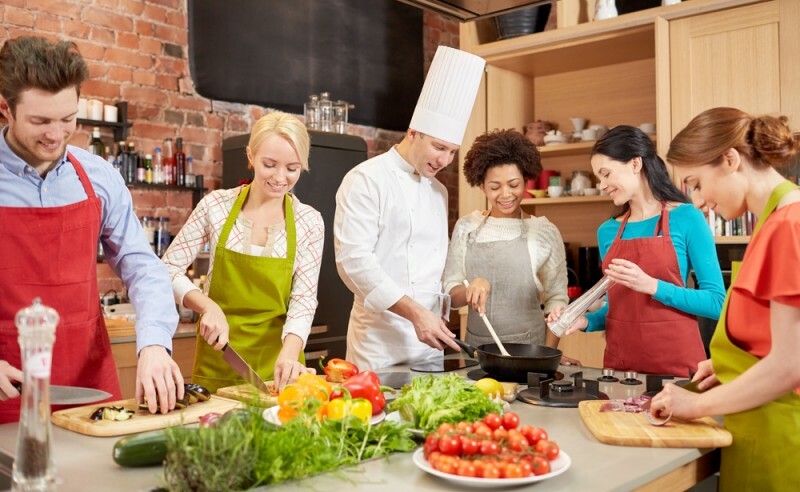 For example, a local restaurant might host a small chef-led cooking class, a sports club may offer a nutrition seminar and a local non-profit might host a fundraiser party. When developing your event ideas also consider what types of activities your target audience would enjoy, and keep in mind that the topic does not need to be directly related to your business offering. For example, a financial services company might host a golf clinic or a retirement community may host a discussion night with a local author, historian or a late-golden era Hollywood actor or actress. An event can be as simple as a book signing by a local author or as elaborate as a large gala with dinner, entertainment and a silent auction. Another strategy is to use social media to promote your events. Local Facebook or LinkedIn groups, Nextdoor and CitySocializer are all great places to post events. Don’t forget to create an event hashtag and include photos or a video. Online events calendars and the digital versions of local newspapers and media sites are easy to submit to. They usually publish immediately or much quicker than the print versions which may have long submission lead times. Your company blog can be very effective for promoting local events. Consider writing a dedicated post about the event, or develop an article on a related topic with a plug for the event at the end. For example, to help promote an outdoor summer event or an event that includes a gift certificate to an ice cream shop, you might develop an educational-type article about different types of ice cream or an info-graphic showing which flavors are most popular in different cities or regions. There are many methods of offline promotion that can be effective for reaching your target audience, especially when they are integrated with your online promotion strategies. For example, you could distribute postcards or a direct mail piece with an online promo code. Similarly, an event invitation sent by email could include a link to an online invitation or RSVP form. Consider sending a press release about your event to local newspapers and regional magazines. Another tip is to use tracked phone numbers for any printed promotions so that you’ll have a better idea of which promotions were the most successful in reaching people. Lastly, everyone loves swag. Don’t forget, if you’re promoting an event with magnets, frisbees or any other event branded merchandise, be sure to print a URL on the item. All of the promotion ideas mentioned above work best when used together as part of an integrated approach. For best results, take some time up front to plan your outreach strategy. Also, make sure each touchpoint offers a way for potential attendees to reach you – this may be an RSVP form on a blog article, a tracking number on a postcard or an event URL in a social media post. And lastly, remember that a photo or video is often worth a thousand words. Research by Eventbrite revealed that YouTube and Google Images were the top two places that users bounced to after visiting an event page. This implies that the visitors were looking for additional information about the event. So, be sure to optimize your event listings and event blog posts with appealing and informative visual content. This could be in the form of a video from a prior year’s event or photos of the venue, the presenter or past attendees. 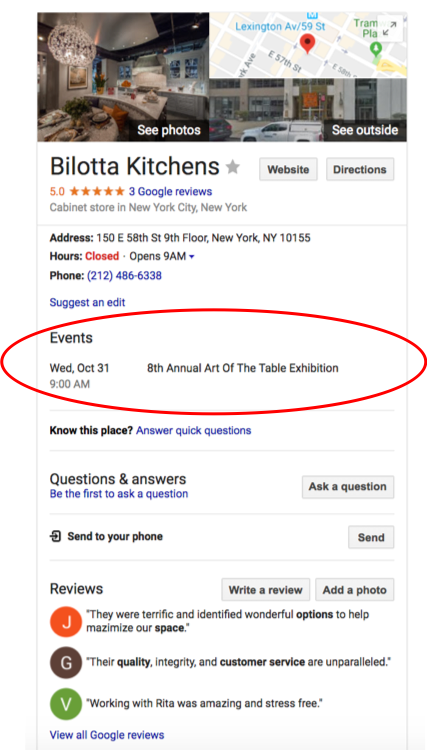 As of late 2018, we’re seeing event listings from various sites being pulled into Google Business Listings. The below example is from an event listing on Patch.com. Events provide additional content for your Google Business Listing, further heightening its visibility and increasing the likelihood of a website visit or phone call directly from the listing. Leverage outreach strategies to improve engagement and visibility. Call periscopeUP today at (443) 475-07787 or Contact Us online.